Well, there goes your morning. Maybe, you think, you should finally get an ad blocker like your co-worker keeps telling you too. But you’re not so sure. How effective are these ad blockers, anyway? Is it really worth your time to block something as benign as a slow-loading banners and the occasional rollover ad? Are ads such a big deal anyway? So you know what they look like because you’ve seen tens of thousands of them. They’re those pesky videos or banners that get in the way of the content you actually want to access. Ads are typically embedded on websites, coming from centralized servers of ad networks. That means your browser not only connects to the website you entered, but also to a number of additional servers that deliver all those distracting videos and flashing images. Since many large websites work with the same ad networks, they can easily track you across the web. 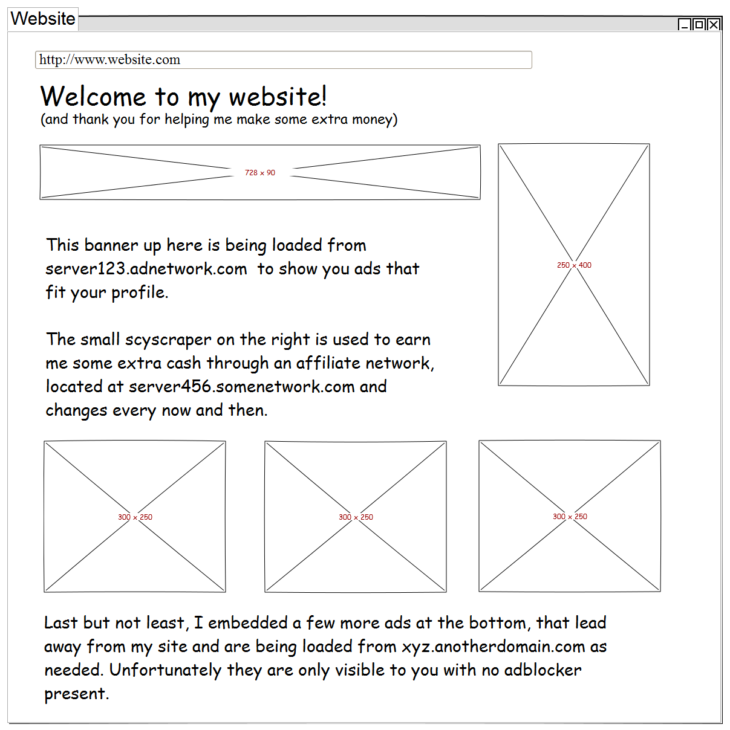 Ads are often embedded from all across the web. These ad networks record when you check the online circular at your local grocery store, look at some job ads, and even when you indulge in a few funny cat videos. Little do you know, the web surfing you’re soon to forget is collected through a combination of cookies and pixel tags and is used to create a very specific user profile about your interests, fears, age demographic, gender, etc. That profile is then used to display ads that are specifically targeted to you. For example, if you’re searching for information on a specific disease, you will be followed by an endless number of ads that try to sell you treatments and medication, even if you just conducted a paranoid search based off of a benign rash. This is called online behavioral advertising, or behavioral targeting, and it’s a pervasive practice that is largely unregulated in most countries. For those who don’t know, ad blocker is a software or browser extension that filters all HTML elements that are expected to contain ads. Since most ads come from known third party servers and have standard image sizes, it’s relatively easy to detect and remove them. Almost 200 million people worldwide use some form of ad blocker, according to a survey done by PageFair and Adobe, and it’s easy to see why—ads are the annoying eye sores of the internet. But there are other, more significant reasons to use an ad blocker. Ads often take the biggest chunk of the total data to transfer, and video ads and animated ads tend to take a lot of CPU resources for rendering. The worst ads even start grating audio in the background which really puts a strain on bandwidth. Ad blockers not only hide these elements, but effectively avoid transferring them from the servers. An ad blocker can save you hundreds of megabytes of traffic a month, not to mention significantly increase loading speeds of your favorite websites. A good site to see how much data is transferred from different servers while opening a website, including the delay in loading is Webpagetest. If you are using Chrome, you can view details about loading and scripting in the developper tools (F12). 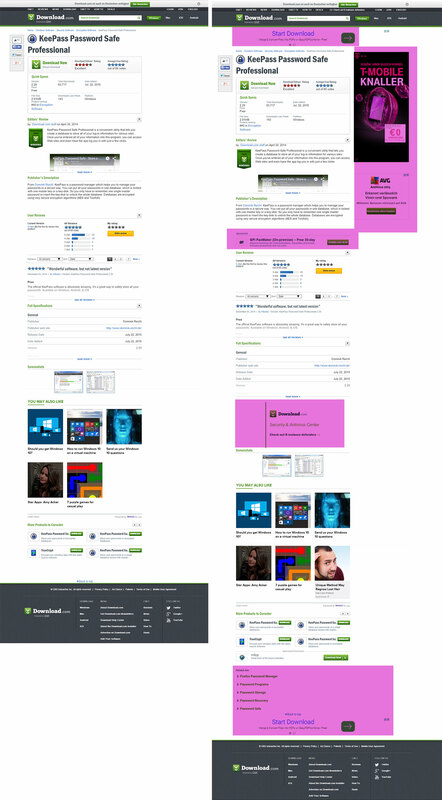 The example shows a typical ad-heavy page being loaded with and without an adblocker present. Did you know you can actually get malware from ads? Ad networks have been hacked or infiltrated to serve manipulated ads in a practice known as malvertising. These manipulated ads contained hidden exploit code that targets unpatched leaks in browsers or in browser plugins, like Flash or Java Runtime. Since the ads were served through so many websites, attackers could spread their malware to hundreds of thousands of victim PCs within minutes. But that’s not the only way to get malware from an ad, since they are frequently designed in ways to mislead users. For example, they imitate error messages or software buttons to get a click. On download portals these ads often imitate download buttons to confuse users and misdirect them. Misled users then often find themselves on shady websites that try to make them download PUP bundles that showcase even more ads, feeding a vicious cycle. If you remove all the ads (see pink areas on the right screenshot), the page gets a lot shorter and looks less crowded (as shown on the left). Privacy is one of people’s number one concerns when it comes to ads, and it’s often why they choose ad blockers in the first place. For example, let’s go back to the rash incident mentioned above. Imagine you spent an insignificant thirty minutes researching a toe rash that ended up just being nothing more than some itchy bug bites. This is where your privacy problem begins: if that data is combined with personal information, such as your full name and address, your profile can be sold and distributed in ways that can affect your daily life. For example, it’s possible that an insurance company may deny your application if they suspect that you have a pre-existing condition, or a company that you applied to work for may reject your application because they fear hiring someone with too many health issues. There is no guarantee that your private browsing information can’t fall into the wrong hands. There may not seem to be many disadvantages to using an ad blocker, especially given all of the compelling advantages, but there are a few key problems with them and how they currently exist. Using ad blockers greatly affects revenue streams of online content creators, and can put your favorite blogger or youtube star out of business. This can be a major concern for you if you do like to follow popular tech and gaming sites, which are notoriously run on ad revenue. There are two things you can do to rectify this situation: be willing to pay for quality content, or selectively disable your ad blocker for sites you want to fiscally support. Most ad blocking extensions and software are free, which may initially seem like a great thing. Unfortunately, the demand for free software, similar to the demand for free content, creates a conundrum for developers who still need to earn a living somehow. After all, creating a good ad blocker requires resources. So these developers may have to take questionable methods to create revenue, which in turn can compromise your ability to effectively block ads. For example, Adblock Plus, an ad blocker that dominates the market, automatically white lists certain ad networks that pay them a hefty sum. You can choose to block these ad networks manually, but you can’t deny that there’s a conflict of interest when ad networks are footing the bill on your ad blocker. It sounds eerily like these companies are paying ransom on their advertisements, which is something we’re all too familiar with in the anti-malware industry. Adblock Plus is an open-source browser extension that is available for Firefox, Chrome, Internet Explorer, Safari, Opera, and Yandex. It has healthy ratings and reputation for most browsers, but as mentioned above, it whitelists “acceptable” ads. Ublock Origin is an open-source extension available for Chrome, Safari, and Firefox. It is well-known for it’s light resource use as compared to its competitors. So remember, next time an obnoxious ad wastes your time or your bandwidth, you do have options. They may not be completely free of complications, but ad blockers can really make a difference when it comes to your security (and sanity) online. Have a great, ad-free day!